“I am not afraid of losing my mind, as long as it happens a day at a time,” announce Citizens! in their song, “Reptile,” a track off their smashing 2012 debut, Here We Are. Their music is all about melody; you can get involved in their songs in a completely unsterile and intimate way. As evidence I submit “(I’m in Love With Your) Girlfriend,” “She Said,” “Love You More” and “Let’s Go All the Way.” There’s disco, New Wave, indie guitar . . . fast-paced loveliness. 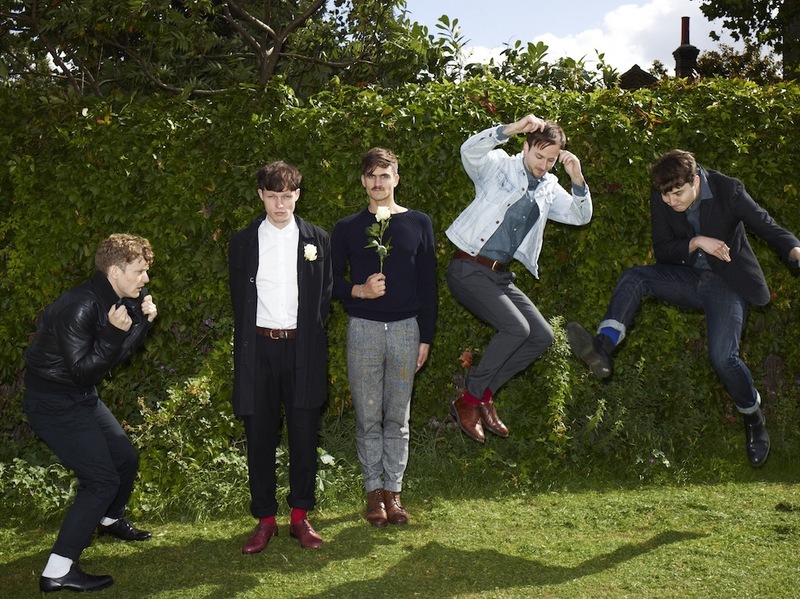 The British five-piece boldly announced their international presence with an album released by the French label Kitsuné and produced by Alex Kapranos of Franz Ferdinand – two superb people to have in your corner when you’re making great, appealing pop music. Last week I talked with Mike Evans, Scottish-born drummer of Citizens! (don’t forget the exclamation point, it’s part of the name). Evans also provides backing vocals in the band, which includes singer Tom Burke, who has become a new face for Hedi Slimane/Saint Laurent. That’s right, this is a 100 % handsome band. As they drive through the States, Evans mentions that it’s really pretty, but “we’re driving through snowdrifts and cars are coming off the roads.” They soldier on. One activity Evans has been able to partake in as a visitor to the States is sampling the local beers (at the time of this interview he’d enjoyed Brooklyn Lager the best). Of course not while driving through snowdrifts. Citizens! – Mike Evans is center, with flower & with more than a passing resemblance to film star Omar Sharif. When it was time to record Here We Are, Citizens! headed to Kapranos’ isolated studio in rural Scotland. Sometimes you hear tales of tempestuous album recordings, but for Citizens! Evans says, “It was wonderful. It was in the middle of nowhere, away from the usual distractions. We really focused on what we wanted to achieve as a band. Working with Alex was a wonderful experience. He really challenged us, and made us ask ourselves questions about every aspect of each song.” To me the album sounds as if it could transfer to a live show quite well – and very straight forward in some ways. I can’t seem to put this elegantly – Evans says it better: “There’s no trickery whatsoever. We really wanted to get that across, which we’ve managed to achieve. It’s a very human record. Alex was very instrumental in that. It’s a band playing parts and songs – it suits the ethos of the band.” As far as Evans’ top track off the album goes? “I think we got pretty close to what we imagined with “True Romance.” We wanted to mix up all of the parts having the poppy and repetitive piano riff and bringing the influence of the drums from somewhere else – that no two parts of the song sounded from the same era.” That might just be one of the most appealing things to me about this band, the disconnect in times. There’s a page on SoundCloud I came across of Evans’ solo work. I recommend checking it out, as it shows he’s an excellent singer-songwriter individually as well. When I tell him the songs actually brought those good tears to my eyes, the kind you get when you hear pretty music, he is genuinely surprised. “It’s stuff that I do that isn’t quite right for the band. It’s a silly page for silly stuff.” When he calls it half-baked, I object. I would love to hear the fully-baked. Which brings me to a little tidbit about Stevens, he likes to cook. He received a tagine from Kapranos “totally out of the blue.” “There was no looking back,” he says. Citizens! play Neumos Monday, March 25th. Written by: Dagmar on 03/22/2013. This entry was tagged citizens!, mike evans, posted by dagmar. Bookmark the permalink.